A 5.3 may not sound like anything worth doing at a crag with so many classic moderates, but Hopscotch is a surprisingly fun romp for the grade. The easy climbing is balanced by nice exposure and a great view of climbers on the more challenging Sentinel Buttress lines across the way like Zoo View. Starting from the spacious ledge, climb the blocky face just right of a wide crack system (feel free to use the crack if you're carrying big gear. Trend up and right to finish on a nice belay ledge about 10' below the rap station. Building a gear anchor here is a better choice than belaying from the rap rings. Hopscotch is located between Washboard and the Egg Wall, left of the Sentinel Buttress. Start on a spacious ledge above the trail. Well protected with mostly medium gear; tricams are a good option. Rap from a slung chockstone in a short chimney (check the slings to make sure they're in good shape). Looking up from the start of Hopscotch. Optional belay ledge for 1st pitch. Ledge at the top of first pitch. Hopscotch. Easy but fun adventure climbing. Selected Climbs describes this as one 140 ft pitch to the "summit". This is so wrong. 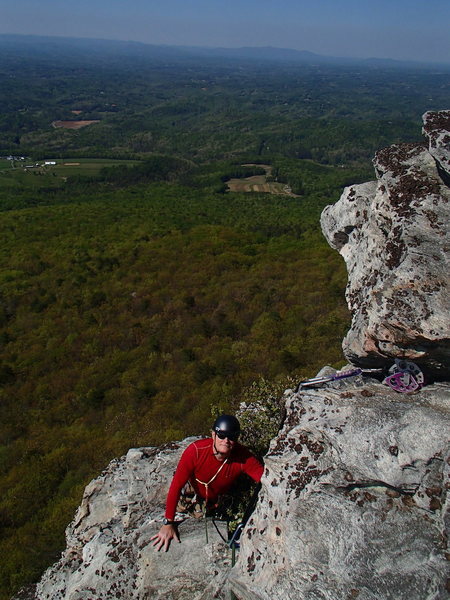 If you plan on going to the top make sure you stop and belay a second pitch below the rap station. If you stop at the large ledge about 90 feet off the deck the second pitch will have tons of rope drag and a 60m rope may not suffice (we had a 70m and used almost all of it). I am 63 years old and have been climbing for only 2 days. 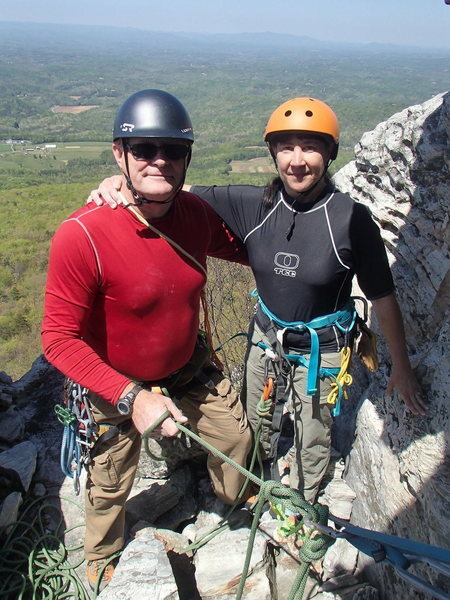 My wife who has never climbed either and I, were escorted by Keith Vestal, a long time climbing tour guide, up Hopscotch and successfully crested the top with no incidents. For us, this was a pivotal point in our lives.....very easy climb looking back, and we learned a lot. Broke the climb up into three pitches. First pitch stopped at the ledge with the small tree - below the "big" tree. Second pitch went up and to the right of the big tree and the rap rings. After passing the rap station, found a ramp heading left. Literally walked up the ramp & built an anchor for pitch #2. Third pitch was straight up to pine trees at the top. 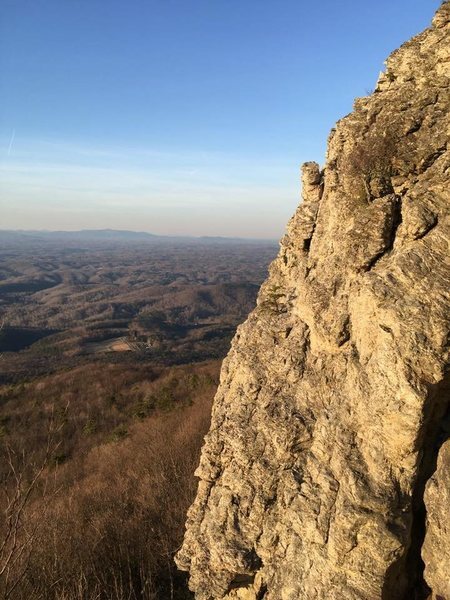 Climbed this with a friend last week. Nice views behind the whole way up, don't forget to turn around and take it in for a minute. Added a fresh loop of webbing to the rappel anchor at the top of the second pitch for peace of mind. A view of hopscotch from the Crow's Nest.